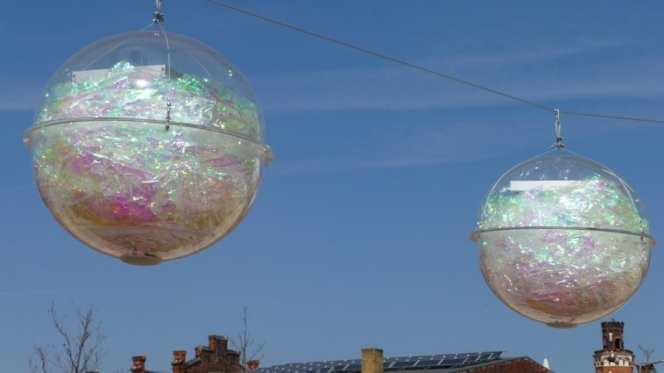 Eight balls of transparent material, solar cells, electronic sound units—with sounds by Marc Lingk. Through a work transposed to the present, the installation commemorates the Canticle of the Sun by St. Francis of Assisi, a poem written in 1224 and dedicated to the sun. The hymns to the sun, repeated eight times, stand for Francis’ deep understanding of nature; respect for the creation was at the very center of his thinking. He might be called an early patron saint of environmentalism. Art in connection with an innovative technology, framed in a futuristic object, its form corresponding to a traditional representation of St. Francis of Assisi, who was depicted standing on a ball. The image of the ball that captures the energy that feeds us all, transposing it into a playful aesthetic note, a sound, is a synonym for the life-maintaining transformations of energy. Sonnengesänge—content becomes form, even in terms of wordplay. Through internal solar cells, electronic sound units are created. A composition developed for the project by Marc Lingk on Francis of Assisi’s Canticle of the Sun is heard in several modulated variations. Each ball has its own sound. The volume changes according to the exposure to light. The technological unit inside the transparent ball is hinted at by a mantle dissolving in spectral colours (consisting of a throwaway product here, too, a reference to St. Francis, who picked up things that were carelessly thrown away...).